Looking for plant containers near Thirsk? Anybody around you who has been to Whitegates Nursery in Northallerton will tell you that we have a large collection of plant containers on our premises. The trick about the ultimate display of houseplants in containers is that the pot should complement the plant it preserves. This goes for their shapes, sizes, height, and colour. This is why you should select your containers from as big a collection as you can access. What plant container do you need? Your plant pots and vases allow the green of your garden and the colour and scent of the flowers to find their way indoors. Containers let you take beautiful bits of your garden to your patio, windowsills, and into the rooms. When buying plant containers, you should remember your objective for the whole exercise. This will help you browse through the endless variety of containers you come across in a place like Whitegates Nursery. You have to act smart to make sure you get the best out of your shopping trip. Picking the shape: You should pick the shape of your plant containers in a way that it suits the plants or flowers you are making it keep. For instance, if you want to plant a root vegetable, you cannot use a small pot with little depth. Later on, that will become a problem. Picking the size: You will find an obvious quality to our display of containers near Thirsk. We keep a big variety of sizes for pots. This is so our customers can easily find the size most suited to the plant they have in mind. For instance, if you are planting a fast growing fruit stalk, it will soon become hard for a small plant container to handle. Picking the hues: Dull shades of vivid flowers and brightly coloured plant containers for dark hues of the potted plant - that is the general rule of thumb. However, you might have a different plan. For example, if you are working across the house with a theme, stick to it even if it goes against this rule. Customer service has always been the centre of our focus. This focus is one of the factors that lead us to maintain a well-stocked inventory for every category of products. Our stock of plant containers is no different. The more variety we keep in our displays of plant containers near Thirsk the more customer choices we can tend to. For years, we have been paying close attention to our customers’ preferences and filters. We keep a check on what our visitors are buying and what they are leaving behind in comparison. When it comes to plant containers, we have seen all sorts of products being picked by our customers depending on what they have in mind about the use. 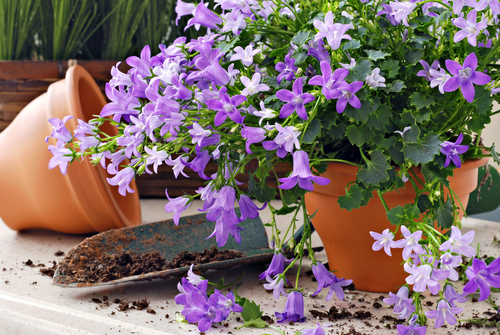 Some customers pick vividly fashioned clay pots to give their patio a lively, warm look. Some others prefer wooden containers to plant all of their favourite wild-looking plants. This knowledge allows us to serve our customers with what we know they would like and to keep them happy. At Whitegates Nursery, we are always looking for ways to please our customers and add value to not just the money they spend on our premises but also the time. With our collection of containers near Thirsk, people visit us from the town all the time and we want them to know the services they get in the Nursery are worth the drive. For example, our customers are always interested in getting the opinion of our experts once they are over and realise they have this luxury. Our aesthetics experts dispense priceless advice on what colour combinations they should go for along with the sizes and materials that would suit their needs back at home. Looking for instant gardening tips? Visit our garden tips page. Like any other collection, it takes time to perfect your display of plant containers. You can only make it truly complete with a few trips to Whitegates Nursery over the seasons, also to find the most beautiful plants. Visit us any afternoon of the week and we will help you get the best plant pots for your home.